Chandi is like a road roller. She creates a path if there is none, moves slumber to action, gives inspirations and holds hands till the end. She is Mahakali, Mahalakshmi and Mahasarasvati, all in one. Chandi Homam is a worship of Goddes Durga as the Mother of the Universe (it is considered an amalgamation of three deities, namely, Maha Kali, Maha Lakshmi and Maha Sarasvati). The purpose of the Chandi Homam is to remove any obstacles or blockages in growth – both internally and externally – for a person or a group of people. Chandi Homa is very useful for getting success, wealth, prosperity, fame, removal of fear, health, longevity, fulfilling of desires, food, progeny, strength, removing ailments, removing danger etc. Achieving success in all endeavors: examination, job, etc. Success in business ventures and professions and to overcome problems in business. Attainment of health and longevity, curing physical disabilities, severe infliction’s and mental disorder. Begetting progeny (children) and also preventing deformities and pregnancy related problems. To ward off malevolent planetary influences and ill effects of sorcery and witchcraft. 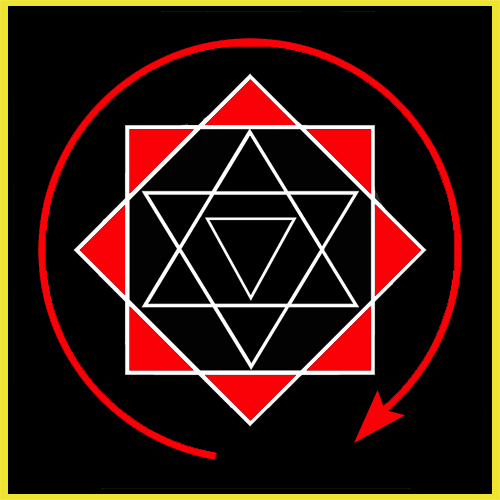 To resolve Jathaka Dosha and Vastu Dosha. Before starting the Homam, meditate on Ganesh which removes obstacles and asks all deities and Gurus to assist you in the execution of the Homam. If you have a Pavitram (a ring made of Darbha Grass or a special ring made of metal), wear it now. If you don’t have a Pavitram, take any ring that you have, pray to your Ishta Devata and wear it. It should be worn on the right hand ring finger. If you don’t have a ring, don’t worry and move on. With the ring finger take a drop of water and put it in the palm of your hand, then put in the mouth by placing the heel of the palm on the lower lip. Śuddhi Vastra – Clean with your handkerchief. In order to not have any obstacles in your Homam, you have to pray to Ganesh in the beginning. Here, if we want to make a longer version, we can extend with a real Pūja to an idol of Ganesh, otherwise these verses are enough. Take some Akshatas (raw rice + ghee) on the left palm. 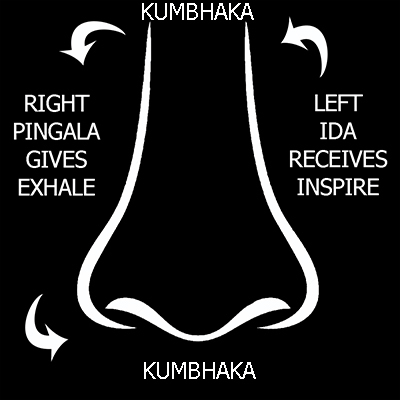 Hold the nostrils with your right hand and do Pranayama. The little finger and the ring finger on the left and the right thumb on the nostril. Inspire. Close the left nostril, open the right nostril by releasing the thumb. 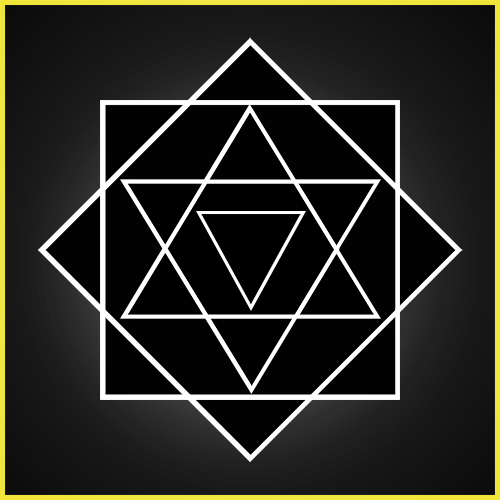 Inhaling - one mantra, holding - one mantra, breathing out - one mantra, holding - one mantra. 108 times. Then leave the Akshata in front of the Homa Kundam and sprinkle a little water on the palms. Then light a lamp (in oil or with ghee). Place some Akshata and a flower in the vessel containing water. Think that the essence of the various rivers of the world is entering the water of the vessel. Then showing Dhenu Mudra say: BHAG BHAG. Then sprinkle with a flower a little water on yourself, on the Homa Kundam and on all the material used for the Homam. Put white rice powder in Homakundam and level it. 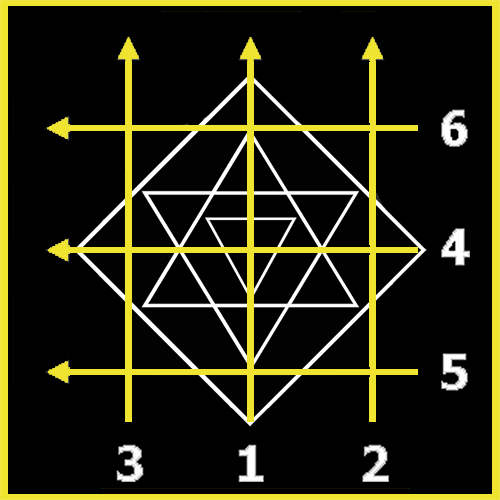 Draw six lines in the Homakundam in the sequence 1-2-3 - 4-5-6 with the following six mantras offer Akshata on lines from start to end of arrows. 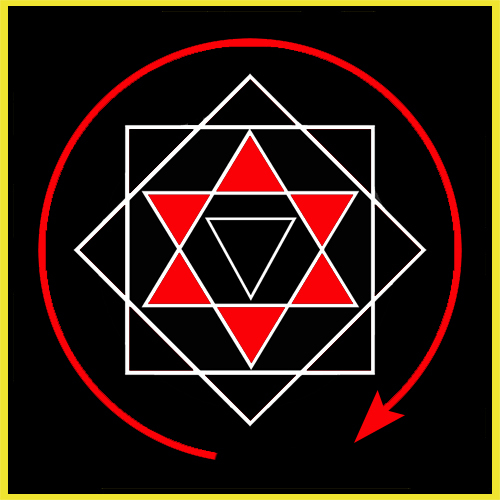 Draw in the Homakundam an Ashtakonam Ashtachakram (Muladhara chakra - two square), a Shathkonam (Svadhishtana chakra - two triangle) and a Trikonam (Ajna chakra - triangle), each within the proceeding one. 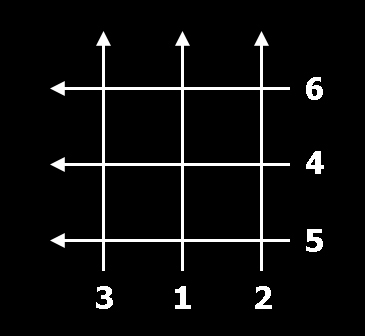 Organize Homa sticks in a pattern of a triangle. Place a lamp of camphor in the center. Keep one wick dipped in ghee on top of camphor, and another on the east edge of triangle of sticks. 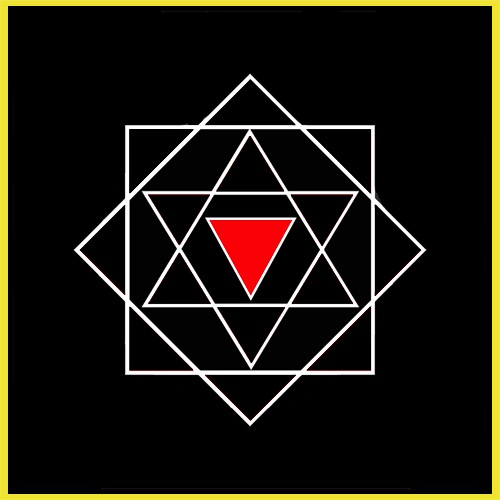 Visualize union of BRAHMĀ and SARASVATI in the triangle. Join two wicks and place them beside a single wick in an earth or brass vessel to Nairriti (SW). Light all three wicks. Keep the single lighted wick down on the ground saying this belong to Rakshasas. Look at it saying Mul Mantra of Guru Mantra. Sprinkle SĀMĀNYĀRGHYA on it with Mul Mantra. Take two incense stick and beat the light saying PHAT, keep them on two side of lamp. Protect it with right palm facing down, saying HUM. Show Dhenu and Yoni Mudra to the light. Saying this, imagine a lighted wick rising up from the base of your spine, going out of your third eye to merge with the external light. The external lighted wick thus becomes the Yoni of Sarasvati who combines inside with outside with her knowledge. Saying this keep the lighted wick on top of the Yoni of Homakundam (a place shaped like a Yoni between you and Homakundam) put the sticks on either side. Stand up. Saying Om Hrīṃ thrice, take only the light, rotating it thrice in the Homakundam with it. The camphor in the center of the triangle gets lighted automatically. Pour the remaining ghee from brass\earthen pot on the edge of the triangle. Sit down. Put some thin, light weight dry sticks on the fire and make the fire glow bright. Show Jvalini Mudra as finger opening up like a blossoming flower. Imagine that the Yoni of Sarasvati is filled with nectarine ghee. Place 3 PARIDHI sticks (the sticks that mark the border, the perimeter) around outside the Homakundam. Stout and short one on West edge on ground, thinner and medium length on South, then thinnest and longest on North. This complete the Agni Mukham. Offer 4 Āhutis for Ganapati with ghee. Offer 108 Āhutis for Chandi with ghee. Offer Āhutis according to your Sankalpam with ghee. The PŪRNĀHUTI DRAVAYA must be offered into the Homam while chanting SVĀHĀ. Having performed PŪRNĀHUTI to music and drum sound. Go round the fire 3 times saying Gayatri Mantra. So saying invoke the fire into yourself, imagining that you are bathing in the fire.